Cultivating Connection and Strengthening Engagement 500% better. That’s how much more we retain information when told to us in the context of a story. Five hundred percent. Why? Because communication plus storytelling creates connection. Invokes passion. Engages emotions. And most importantly? Moves people to take ACTION. 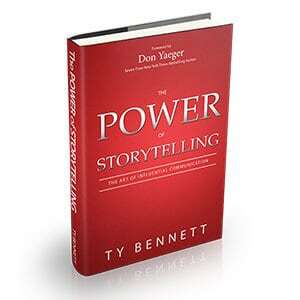 Teaching audience members to effectively and creatively adopt the skills and mindsets necessary to communicate at their highest level is exactly what Business Keynote Speaker Ty Bennett delivers in this game-changing topic. In today’s world, the right communication skills top the list of the most valuable tools sales and business professionals can cultivate. By mastering the art of storytelling communication your team can connect more. Close more. Retain more. And develop long-term valuable relationships both personally and professionally. If communication skills are on the top of YOUR organization’s must-have list – contact Ty Bennett today.